I hope you’re getting dozens of clicks and comments on every post you share on LinkedIn. If this goes on long enough, you might start questioning why you’re posting content on LinkedIn at all. It’s the end of the year, after all – a lot of us are thinking about our content strategy and investments for next year. If a platform isn’t performing, we’d be smart to cut it. That would be a shame, because having a LinkedIn network can be an extremely valuable thing. It’s a long-term investment – an asset – almost every successful person swears by. And if you’re in B2B, of course, having a network can also be a valuable source of business. A big part of maintaining your network is sharing content they engage with. So instead of going cold on LinkedIn, how about trying a few different tactics for what you post? You can upload videos directly to LinkedIn. Really. The platform quietly enabled native videos this summer. Before then, the only way to post a video on LinkedIn was with a YouTube or Vimeo link. As you probably know already, videos get more engagement than images, and way more engagement than text. Viveka von Rosen says her LinkedIn native videos get significantly more engagement than her regular posts. Not sure what to post? 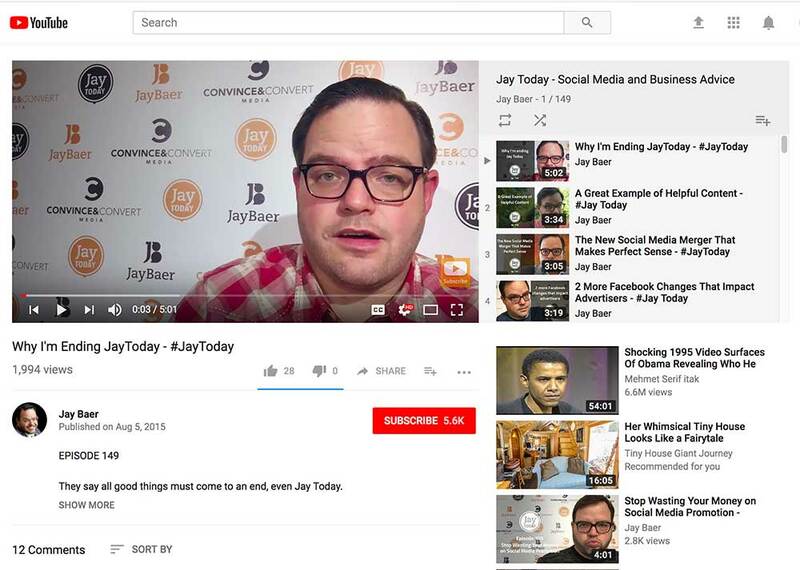 Here’s some inspiration: A while back Jay Baer was doing short, 3-minute video posts in a series called Jay Today. They were clever, timely and useful. Could you contribute something like that to your industry… even if you only published one a week? If you do consider a short video blog like this, definitely watch Jay’s last Jay Today video, where he walks through why he ended the series. It might help you frame the editorial mission of your video posts. Jay Baer’s vlog, Jay Today, was one of the first short-format video series. You could use it as a template for your own short video series on LinkedIn. One of the golden rules of content curation applies to LinkedIn: Add your own words to whatever you share. Add your insights about why a certain piece of content is important. Even if it’s just a sentence or two, your comments add a key element of value to what you’re sharing with your audience. 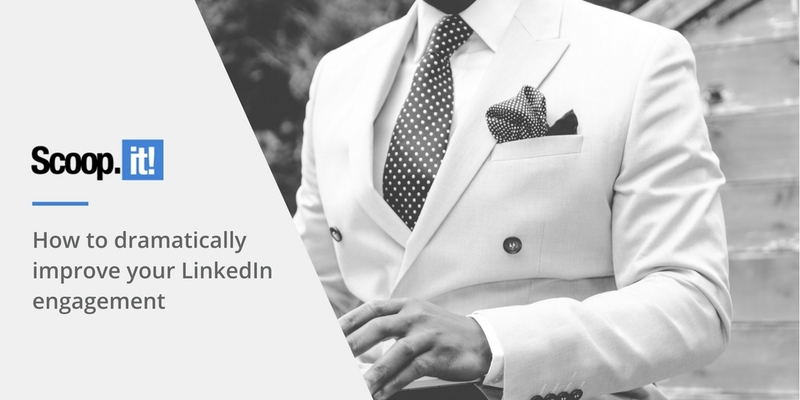 Without your opinions and insights, your LinkedIn feed devolves into just that… a feed. And trust me, we have enough of those. 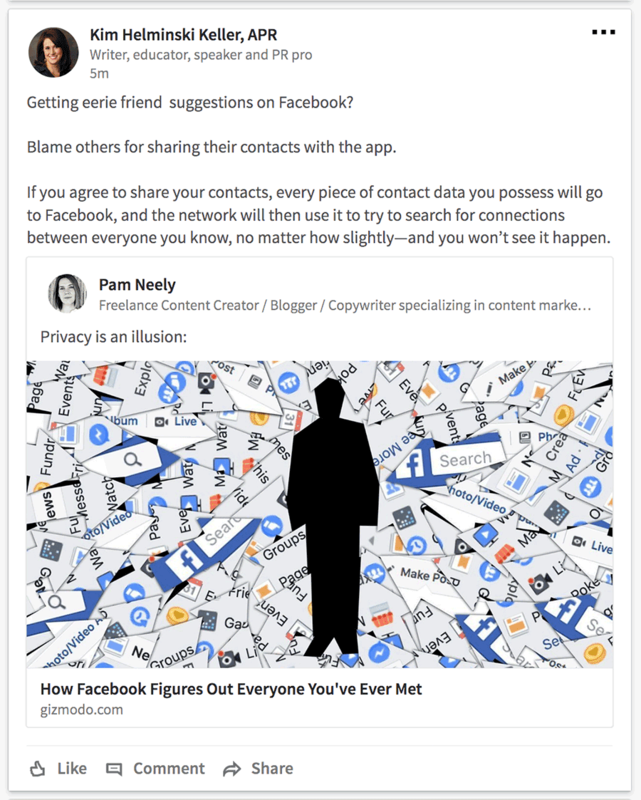 Kim Keller added a great summary of this article when she reshared my post. At the risk of pointing out the obvious, the more people who see your posts, the more engagement you’re likely to get. So adding more connections is a sure way to get more exposure. How do you get more connections? My favorite way to do this is to check Twitter. I’ll look for whomever I’m following that’s following me back, and if they’re someone I’d like to be connected to on LinkedIn, I will send them a LinkedIn invite. Just not any invite. A personalized invite. Actually, whether you have no connection to someone or if you’re their best friend – please – personalize your invite. You’ll get better responses. And you’ll have made the internet an incrementally more friendly place. Also, understand that not all connections are created equal. So don’t just go for volume. You don’t want the biggest network – you want the best network for you. Connect with people you actually want to know. People who are likely to be interested in what you do and to respond to what you post. 4. Attract your traffic to your profile and your posts by maxing out the skills section of your profile. You can add up to 50 skills to your LinkedIn profile. It’s a great way to let people know what you’re capable of, and a way to let people endorse you for those skills. If you want to do something nice for someone you’re connected to, endorsing them for a skill is an effective, super-fast way to do it. This is also a non-invasive way to nurture your connections with people on LinkedIn: Endorse them for a skill or two. It’s basically a way to do lead nurturing via the platform. The posts I see getting significant responses on LinkedIn are always question posts. Sometimes they’re just people asking for referrals, like Kait LeDonne is doing here. Other times, questions are used to ask people how they’d handle a specific situation, how they’d deal with a common problem… or even just what they think of two different book covers. Questions like this can reveal a bit about who you are, of course. 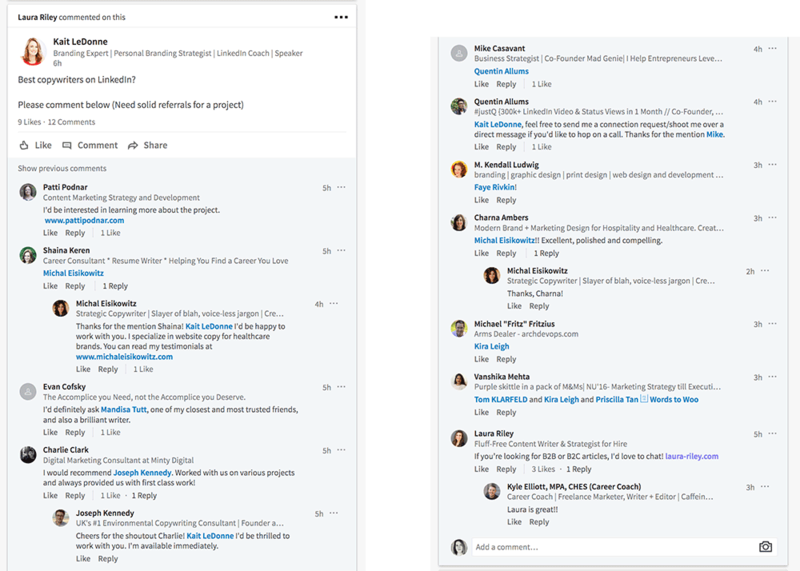 And that brings up an underlying issue of why so many LinkedIn feeds get low response rates: A lot of us, hoping to appear professional, drain most of the life and opinion out of what we share or say. Playing it too safe on LinkedIn (and in life) may keep you out of trouble, but it will also keep you invisible. 6. Try liking your own posts. This may seem a little dicey, but LinkedIn user John Espirian says liking his own posts and comments has gotten him more engagements. This works because of the principle of “social proof”, as explained by Robert Cialdini in his classic book, Influence: The Psychology of Persuasion. Social proof is basically the idea that we tend to pay attention and like what other people have paid attention to and like. So if you can kind of jump-start the engagement on your posts by liking them, when people are zooming through their LinkedIn feed and see your post, even that one like may slow them down a bit. 7. Let the whole world see your posts. 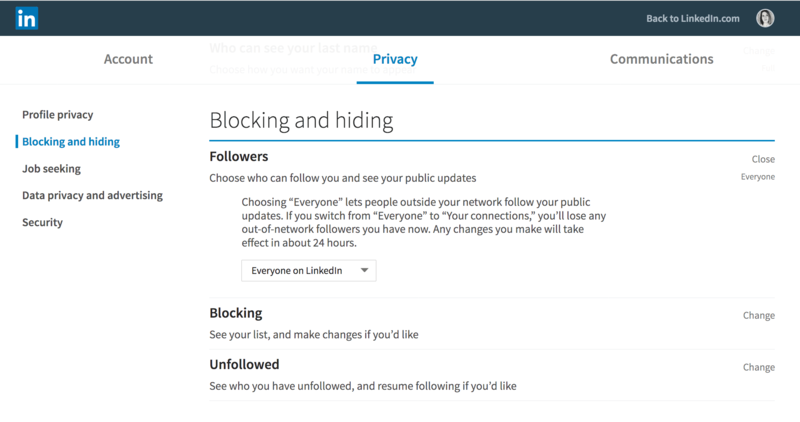 You can miss out on a lot of engagement if your LinkedIn privacy settings are set to only show your updates to your connections. To change this, go to your LinkedIn “Me” tab in the upper right-hand corner of your browser. Click “Privacy & Settings”, then click on “Blocking and Hiding” in the left-hand navigation. 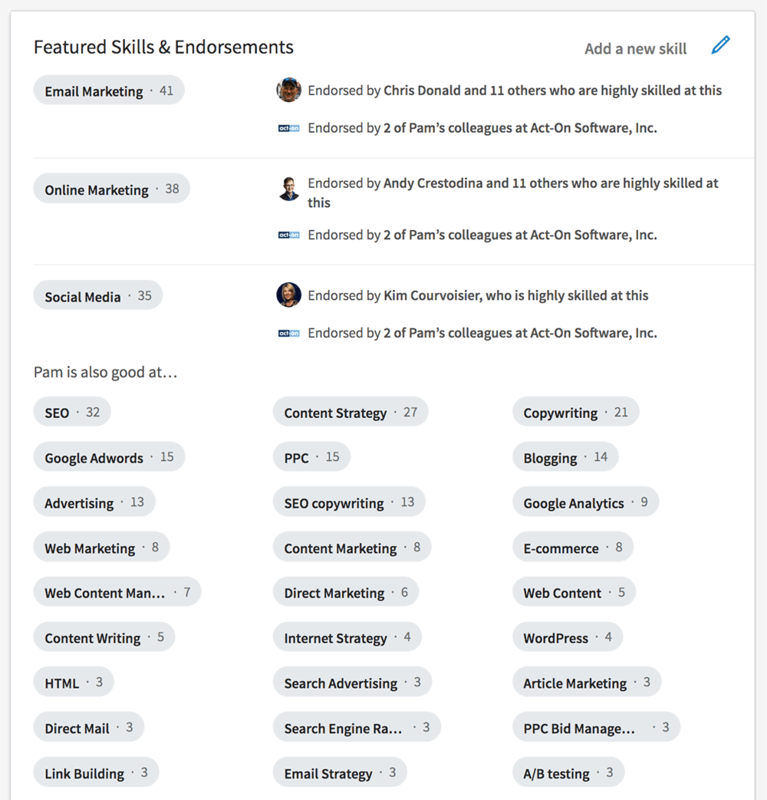 Make sure the “Followers” area is set to let “Everyone on LinkedIn” see your public updates. It’s a three-minute fix that could significantly expand who sees your posts. Got any tricks that have worked to get more engagement for your LinkedIn posts? Share a tip or two in the comments. 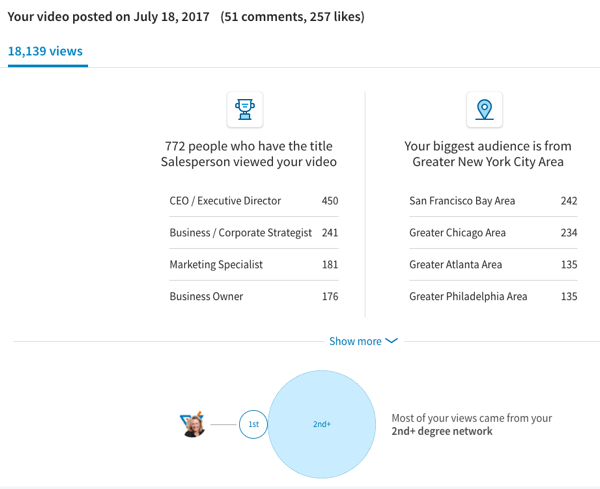 2 Comments on "How to dramatically improve your LinkedIn engagement"
Thanks for sharing such a nice techniques. will sure implement all those tips it will definitely increase our linked in engagement. will recommend my colleagues and friends to review this article. Nice work Pam.This is very thorough post. I especially like the point about “letting everyone see your posts”. This allows other assess about you better. Thanks for your research and advice. Nice post. Keep writing.